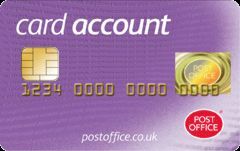 If you are in receipt of any Government pension, benefits or tax credits you can open a Post Office Card Account and have your money paid into it. Take cash out and check your balance. Firstly, you’ll need to contact the Government Department that pays your pension benefits or tax credits and ask about opening a card account. Once a card account has been opened payments from the relevant Government Department will be credited to the account. You'll be able to take your cash out or check your balance at any Post Office branch. You can't go overdrawn as there is no overdraft facility on the card account.